Just like at Aue before, Domenico Tedesco started the game in a 3-4-3. At Aue his Wingbacks often played more like Wingers but on this day they were asked to defend a lot. Leipzig being Leipzig wants to a) win the ball high up the pitch and play it to Poulsen or Werner as quick as possible. Usually, this is how Leipzig are at their best. When in possession, the two most important players tend to be Emil Forsberg and Naby Keita. The former didn’t start and the latter is very good at opening the door via intelligent movement and dribbling through the lines. No team tends to stop Keita from dribbling past a few players at least once or twice a game just like no team stops Tottenham’s Moussa Dembele from doing that. It’s all about limiting the impact of having players taken out of your game. For the most part of the game, Schalke did that very well. When Leipzig had the ball, Schalke retreated into a 5-4-1 or a 4-5-1 shape depending on how deep Leipzig had progressed with the ball. Playing with three at the back and two central midfielders is a good way to deny central penetration because you are likely to always have a man advantage unless you are getting caught on the break. In return it forces other teams to go wide and in the most extreme circumstances you get a crossing fest. Schalke always pressed Leipzig’s wide players. It is still early doors in Domenico Tedesco’s spell but the way they handed over the responsibility for players and zones was already good. The start of the game however, was firmly in Leipzig’s hands. Especially because they managed to stretch the Schalke team vertically and created space between Schalke’s first and second defensive line. However, after Schalke managed to tighten up things, Leipzig didn’t create much and it took them until the 80th minute to trouble Ralf Fährmann. 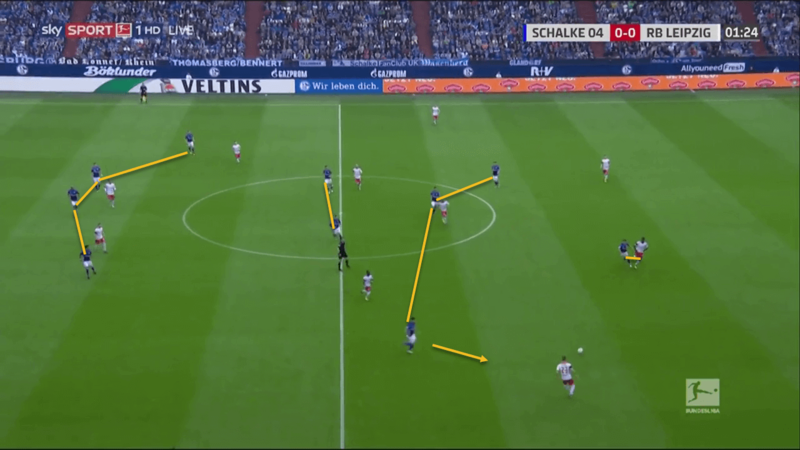 For the most part Schalke let Leipzig have the ball while defending in the mentioned 5-4-1. In that case Leipzig either tried to break through via the Keita route or just played it wide. Timo Werner especially drifted wide on several occasions but it should be noted that – partially due to his speed – Werner has always been a striker who liked to create space by drifting into wide areas. For the most part, Naldo dealt with aerial presence of Yusuff Poulsen. In general, defensive mechanisms and quicker to teach compared to attacking mechanisms because they are more dependent on the movement of every single player instead of the movement of a cohesive unit. But this was not the only reason Schalke resorted to long balls for the most part. Against a team like Leipzig who try to compress space in midfield and will often surround you with three players and no passing options there are two ways of playing: You can either try to play your way through the Pressing or you can play your way around it either laterally or vertically. Option one is not an option for most teams because it requires press resistant midfielders who can dribble their way out of tough situations constantly but even in that case there is often a big risk involved. Schalke chose the latter option and played around Leipzig’s pressing for the most part. But these situations also made it obvious, that Tedesco only started working with the team a bit more than two months ago because when di Santo had to drift wide, the centre was often vacant. A problem they already had last season with Weinzierl, especially before signing Burgstaller. In the second half, Forsberg replaced Halstenberg with Ilsanker going to right back and Keita dropping back into his more familiar centre midfield position. Presumably the idea here was to make Keita threaten the Schalke midfield of Bentaleb and Goretzka and break the most important line of Schalke’s defence. But for the most part, the second half was very similar to the first half. Leipzig had a lot of the ball but they were forced wide which led to them subbing on true wingers like Bruma. Leipzig’s best chance came after they were already 2-0 down but Keita hit Fährmann’s head instead of the back of the net. All in all, Domenico Tedesco’s first game has been very positive in the context of first games of managers. Schalke have shown defensive organisation and a plan regarding how they want to play around Leipzig’s strengths. There is still much to be done and there are still questions about how Schalke will act in games where they have the lion share of the ball but the same applies to Leipzig when it comes to finding a way to beat teams that a) have a plan that negates some of their strengths and b) have sufficient player quality to act on that plan and to punish mistakes. Right now, Naby Keita and Emil Forsberg often have that responsibility.